STUART LITTLE Coming to NBYT! 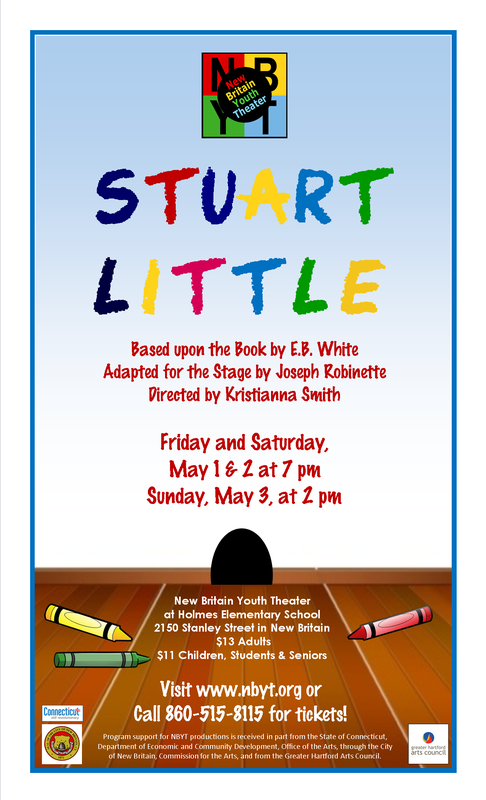 NBYT will perform Stuart Little, based on the children’s classic by E.B. White, on May 1, 2 and 3, 2015, at Holmes Elementary School in New Britain. Stuart Little is the story of a mouse born into an ordinary New York City family. Stuart’s adventures, both great and small, are brought to life as an ensemble cast of children plays multiple roles—Stuart’s family, their cat Snowbell, Margalo the bird, a giant dog, a car, and other people and things—in the life of the mild-mannered mouse trying to survive in a big people’s world. The stage adaptation keeps all of the charm and adventure of the original story by E.B. White, author of other titles including Charlotte’s Web and The Trumpet of the Swan. The book was also the basis for a popular 1999 film and sequels. The NBYT production is directed by Kristianna Smith. Stuart Little will be performed at Holmes Elementary School, a community space located at 2150 Stanley Street in New Britain (enter by way of Huber and Nye Streets). Performances are Friday, May 1, at 7:00 p.m.; Saturday, May 2, at 7:00 p.m.; and Sunday, May 3, at 2:00 p.m. Ticket prices are $13 for adults and $11 for children, students, and seniors. Tickets may be reserved by calling New Britain Youth Theater at 860-515-8115 or may be purchased online through Brown Paper Tickets. Previous Previous post: New NBYT Parent Company Announced! NBYT STUART LITTLE Coming to NBYT!